Introduction Vision Youth and young adults who are productive, responsible compassionate citizens in their communities. Mission To facilitate the development of values and life skills essential for productive citizenship in youth through outdoor experiential education. Introduction Programs Trail Blazers’ holistic, award-winning programming emphasizes emotional, social, intellectual, and physical participation: Summer Outdoor Experiential Education Program – Sleepaway On our forested 1,100-acres, youth live for 14 or 28 days in a “smallcamp,” a family-like group of up to nine children where they schedule their own program in collaboration with their two to three Group Leaders. This structure, known as decentralized camping, is Trail Blazers’ unique approach. Summer Outdoor Experiential Education Program – Day Camp Local children spend mornings and afternoons participating in day sessions, Monday through Friday. Though they go home each night, they are immersed in the same activities that encourage learning, personal development, physical engagement and health awareness. Under One Sky Leadership Program Lessons learned at camp are translated into actions as empowered adolescents learn ways to be environmental stewards in urban settings. Youth start at sleepaway camp and continue via workshops through the academic year. Counselors in Training Leadership Program Teen-aged campers interested in working with children develop the leadership skills, communication skills and competency required to succeed in this field by assisting Group Leaders in the Day and Sleepaway Summer Outdoor Experiential Education Programs. Trail Blazers also provides Environmental Education day trips for schools, Conference & Community services, and Expedition Adventures. 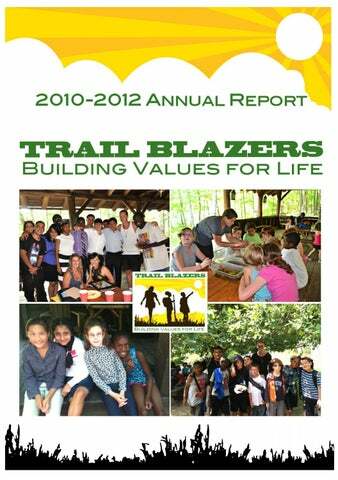 From the Board Trail Blazers enjoyed many successes in 2011-2012. As always, they are due to the hard work and commitment of many people – our Board, our staff, our long-time supporters and our new friends. Their extraordinary generosity of spirit, effort and support makes it possible to continue “Building Values for Life” and helping our campers become more productive, caring and responsible members of their families and communities. We celebrated our 125th Anniversary this year with a very successful and energizing Gala. We are gratified to reach this rare milestone. Trail Blazers is the second oldest American Camping Association accredited camp in continuous operation in the United States. This attests to the enduring resonance of our mission and the quality of a unique program that changes young lives in remarkable ways year after year after year. In 2012, we served 375 children in our summer residential camp and 45 more children in the third year of our day camp. The total represents the most children we have served in a single year. Continuity was again provided by winter and year-round programming, and by our commitment to accepting returning campers for at least three years. Our new Under One Sky leadership program was a great success. We established new partnerships with Children of Promise in Brooklyn and the I Have A Dream Foundation of Newark. Twenty children aging out of foster care in New Jersey learned practical job search skills in a new Intensive Life Skills program while being full-time campers. Our Board has been enhanced substantially by the addition of several new Board members in 2011 and 2012. Their time, effort and talent have served us extremely well. 125th Anniversary On June 19, 2012, guests gathered at the Manhattan Penthouse and joined us in ushering in more years of serving youth with a cocktail reception, auction and seated dinner. All proceeds from this event went towards our Life's Campership Fund, named in honor of our founder John Ames Mitchell, which provides scholarships that enables families to give their children essential summer programming. Honorees Dr. Barbara Brummer and Eric Olsen of The Nature Conservancy in New Jersey received the Mashipacong Award for their work in environmental preservation and stewardship – named for the Lake in which campers learn to swim, fish, and canoe. Our second honoree, Michele Friedman, Executive Director of SCOPE (Summer Camp Opportunities Promote Education), received the Lois Goodrich Award for her work in facilitating affordable camp programs for youth in need – named for Trail Blazers’ Director Lois Goodrich. As this was also a milestone in American Camp Association history, CEO Peg L. Smith sent congratulations via video. Testimonials Excerpt from a parent letter: I just wanted to send you a big thank you! My children came home so different, not just physically but also intellectually and emotionally... [She] found an inner strength about her, she is speaking up and making sure she is being heard. Never ever did this happen before! [He] is much more in tune with others around him, controls his impulses and is not afraid of trying new foods. I am so proud of my children and the growth they are showing and I am sure they will continue to develop as they begin to process their adventure. 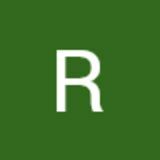 Excerpt from an alumnus staff: …It was this thread through my 20's and into my 30's, the foundation for my professional life. I think the word that came up…a lot was confidence. With that confidence came leadership skills, communication skills, and relationship skills. The ability to develop those skills was directly influenced by the people that surrounded me each year I returned… A mind once stretched by a new experience can never return to its original form. I don't know who said that, but that was my experience each time I returned to TBC. Our Results One strength of which Trail Blazers is particularly proud is our life-long impact on values. In 2012, we sent out a survey to program alumni, some of whom were campers as far back as the 1940â&#x20AC;&#x2122;s. Below are some highlights of the survey results. 87Â˘ of each $1 raised supports essential programming. Our strict fiscal monitoring and a shared resources arrangement with our partners enables us to maintain our nonprofit industry low of only 13% of total budget spent on overhead costs. ACA-SCOPE Anonymous City of Paterson, NJ Department of Education, NY Youth, I.N.C.